In Part 3, I looked in detail at how to cheat ... or more "How I cheat". Some of the cheats I mentioned in there are useful in using the following style. In this part, I aim to look at one of the styles that in my opinion give the game its huge appeal, fills up your photo album and your hard drive. Every family has a story and the same applies to the Sims. On the official site, the Family Exchange is full of stories and houses. The only limit to a story is the player's imagination. As varied and interesting as Sim families are, so are the stories. Firstly, I will look at what components are parts of creating a story and the mechanics of making an epic or a mock TV-series like "Sim Brother" of which I have a small amount of experience. Firstly, you need to be familiar with taking photos and putting them in the album. Without pictures, you don't have a story. Then, you need to look at the following points. Of the official utilities, The Sims Character Makeover Studio (TSCMS) has its uses in changing a characterâ€™s clothes (and appearance). However, I do not recommend it. It is unreliable and does not display custom content. Maxis actually withdrew it from their server but it can be found at The Sims Workshop. Personally, I recommend Sim Enhancer as an all-round editor for looks, relationships and more. For other free alternatives, Paladin's SimWardrobe and SimMetamorphoser can be downloaded from Paladin's place. There are other character editors out there and other utilities that may be of use but it is up to you to find out what you wish to use. This way, you can write someone out of a story and bring someone new in without having to recreate a family. For example, let us look at a really short story and an example on how snapshots, the autonomy cheat and how a character editor can be used to make it happen. There is a lot of rumour currently going around about whether Mortimer is still with Bella in "The Sims 2". Well, you're going to have to wait and see. This plotline is something I put into effect ages ago. However, Bella wonders what Mortimer is up to. He used to help her by doing the washing up and is no longer there. Quietly, she goes into the study and finds him on the Internet chatting with a woman called Natasha. I bet you are wondering how can all this be done without having to create a new sim called Natasha, get her and Mortimer to fall in love with her and get Bella out of the way? Firstly, before you start taking pictures, make sure Mortimer and Bella are still in love. This is essential for the final snapshot in this series..
Now, use the "autonomy 0" cheat (See Part 3 for details) or just turn off free will, which can be found in the options menu. This will ensure that Mortimer and Bella will do what you want. Get Mortimer to play on the computer (snapshot1), get Bella to "clean up" the dishes (snapshot2), "go here" into the study where Mortimer is (snapshot3), and "go here" to the road (snapshot4). Now, save the game and exit. Back up your characters in UserData in the event of an error. Open your chosen character editor and find Bella Goth. Change her face and her clothes, even change her mesh, save the file and restart the game. Bella is still there where you sent her, now looking like someone else who for the photo album we are calling "Natasha". So, send her back up the pathway to the veranda. Now, because Mortimer and Bella are still in love, get Mortimer to "kiss" Bella (snapshot5). It now looks like he is kissing somebody else. "So the camera really can lie?" I hear you say in dismay. "So, those other pictures of Mortimer and Bella on the Jerry Springer show are not really from Jerryâ€™s studio?" "What about the pictures of them having a holiday on the Isle of Simoa?" "And what about the picture of Cassandra walking on the moon? All fakes?" The snapshots are limited only to your imagination ... and even those can be touched up. There may come a time when you want your characters at a higher level than at start-up, giving them friends, skills, money and a good job suitable with their role in your story. Once again, Sim Enhancer is one I recommend that changes almost all aspects of the game. No, I am not getting commission for mentioning them. It would be nice if I were getting something, though. There are other editors out there that do some or most of the parts. If you want to change the relationship between characters, this is the easiest way to do it. Save the game at a suitable point, edit the characteristics (personality and/or relationships) to make them either lovers or enemies. This will give you the hugging and kissing or the insulting, slapping and attacking. It saves a lot of work by not needing to engineer it to happen. "Newsflash! Nelson Mandela to replace Samuel L Jackson and play Mace Windu in Star Wars: Episode III". Yes, it can be done. Every play or film (movie has its actors and its costumes. 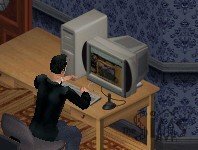 "The Sims" is no exception. Do not worry about creating skins yourself, as there are plenty of them on the Internet fan sites that can be downloaded and used. These can range from "Star Trek" to "Wild West" to "Lord of the Rings". Yes, Darth Vader and Gandalf can take on the Cartwrights from Bonanza. However, I would like to see someone come up with a plausible story idea on this one. The character editors can be used just to change your characterâ€™s clothes where necessary. After all, you do not want to have to go through the entire wardrobe to find the outfit you are looking for, especially if you have the amount of downloads that I have got. "I am going to change your face" takes on a new meaning when it comes to the Sims. For those who have been to the movies, you will find that in most cases, they are not all set around a small suburban street. The main action does not take place in someoneâ€™s house and garden and the big showdown does not take place on someoneâ€™s patio. An adventure can take the main characters to a disused factory, a jungle temple, a Wild West saloon, a starship, an army base, a haunted house or even the Jerry Springer show. And yes, this is a plug for my skin of Jerry and my walls. There are plenty of floors, walls and objects out on the fansites that can be used to build the scenes. So, there is no reason why not different lots in the neighbourhood cannot be used for different scenes. Merely evict the primary characters when the scene shifts and move them into the new house or scene. You can have your main character briefed at an office that is part of a multi-storey office building. Your family album shots do not need to show the entire plot, just the room where the scene has been set. If a scene is not going to be used again, delete the lot. You can always use it for something else. For those of you who have "Unleashed", you probably won't even need to. If you are setting different scenes on different lots, you could create two different families but with a copy of the major character. However, this would give you two separate family albums and that requires a bit of work in splicing them both together. Nevertheless, who is to know really that picture is from what album at the end of the day? How many people actually thought the studio from Sim Brother was actually on the same lot as the house? Yes, the truth has come out. I had two families. One family lived in the Sim Brother house and the other family lived with Will Wright in the studio and only played their part on their Eviction Night. Any existing snapshot can be touched up outside the game with a photo-editing program (I use JASCâ€™s "Paintshop Pro v8") and be saved to remain in the album. This is another area where imagination can come into play to add those special effects. Blood on the patio is one I have seen used before. One effect I have created with PSP is the night-vision pictures in Sim Brother. For any other Sim Brothers out there, it is up to you to work out how to do it as this secret stays with me. I have even seen snapshots from "Sim City 3000 Unlimited" used in a photo album. You could insert a picture from the real world if you so wished. As long as these are saved as a snapshot and as a thumbnail in the correct format (see above), you cannot go far wrong. If you are mixing your albums to get one major album, this requires going into the different parts of the photo album directory and renaming everything so that it is in the right order. The thumbnail is a scaled-down version of the snapshot to a maximum of 75 pixels height used for people with the "Living" Expansion, De Luxe and beyond. Look at the following example to see how the story we began above has unfolded since Bella and Cassandra were given the house following the divorce. Where this story will develop may be revealed in time, but it is not of importance right now. As I have said before that imagination, the props, the costumes and the scenery are the only limits the Story Teller has ... and that is you. A movie is not finished with just "The End". There follows the credits. Several minutes of the theme music and closing credits. â€“ actors, director, screenplay writer and so on. Also don't forget Oscar Night reruns that come from the award winners thanking everyone from their parents down to the person who made his morning cup of tea. With a Sims Photo Album, it is slightly different. You wrote the script, you directed the acting and selected the best camera shots. You also edited the footage and left what you felt was superfluous in the Recycle Bin. However, did you create all those custom objects? Did you do all the skins? Did you build the houses? Did you design all those walls, floors and roofs? I didnâ€™t think so. I believe it is courtesy for your last page to list that you have to thank to make your story production complete so list the sites and the people you got items from. They put a lot of time into creating them and it is not fair claiming that the work is yours. It gives them some publicity and helps those Sim players who look at your album find props that they could use to make their own stories. I would like to thank ChEeTaH, who helped save me some time by staging the photos in the "Mortimer, Bella & Natasha" section of this review. I just thought I'd better put that in so I don't sound a hypocrite. This series is winding to an end but there is one part remaining. Stay tuned to find out what it is all about. All I can say is that without this type of player, most of us would not be here today. Written at 21:09 on Friday 30 July 2004 by Andy.